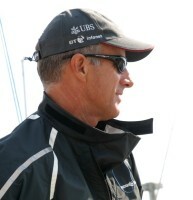 Ed Baird became 2007 ISAF Rolex World Sailor of the Year, after helming Alinghi to victory in AC 32. 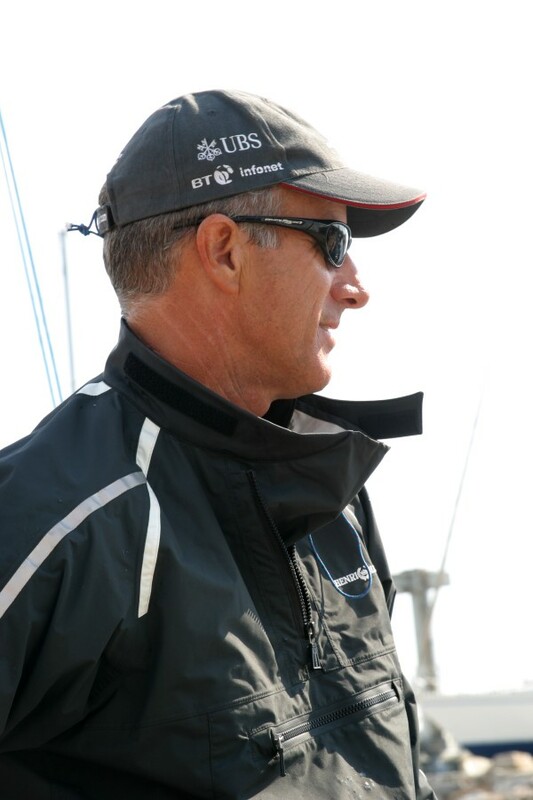 His international successes began when he was Laser world champion in 1980, then Soling and J24 1983 world champion in 1983. He headed the ISAF world classification in 1995-96 and 2004-05 and won the World Match Racing Championship in 1995, 2003 and 2004. Ed has also competed in round the world races. Marian Martin met up with him at the iShares Cup, in Hy�res, and posed some questions about the America�s Cup Deed of Gift match. We�ve become a bit confused about the question of tacking a DoG multi. Both Brad and Jimmy Spithill have said they will be very expensive to tack, but we were chatting to Rob Greenhalgh and he didn�t think they would. What have you got to say? Ed Baird: I think that compared to the 40s it will be a lot more difficult to have a good tack. The 40s are really nice and very efficient with their tacking. These big boats are going to have a little more going on and it�s going to be more difficult to get through the wind and get going again. Francis Joyon told us it wasn�t so much the time it took to tack as the curve you had to follow and the distance you lost. EB: Yes. Obviously, none of us have sailed one of those boats before, but they will be very powerful and very impressive in their ability to sail into wind and away from the wind, but none of these multihulls are meant to be great manoeuvring boats. That isn�t what they are built for, they are built to go fast in a straight line, so when you start turning you spend some distance and sometimes you�ll spend a lot of distance. What will make you decide it�s worth tacking, in terms of wind shift? EB: Remember it�s a case of stay in front of the other boat, or get away from being behind it, so that�s what�s going to drive a lot of the decision making. Sure, if there�s a substantial shift that you�re expecting and you want to go towards that change that�s always going to be something that you�ll put into your strategy, but you wouldn�t go a long way from your opponent unless you were behind and trying to find something good. Jimmy said he expected a lot of separation? EB: If you�re referring to the interview you did that I read, just recently, I thought he was very correct in saying that it will be different from the bow to stern racing we�re familiar with in the America�s Cup or in match racing circuit events. However, think of all the times during the Louis Vuitton Cup and even the America�s Cup when the boats were 6, 7, 800 metres apart, sometimes more than a kilometre. These new boats are going to be what ��.. three times as fast and they won�t be as close angled to the wind, so they are going to go really far apart, really quickly. Now, in a relative sense, where it comes to the time it takes to get back together, they may not be that far apart, but in terms of distance, where it comes to getting both boats in the picture, from the helicopter, you might struggle. In the second race, there�s a reaching leg; what happens if both boats arrive at the gybe mark at the same time? EB: Well, the normal rules will apply; there�s going to have to be some distance to the mark where you�ll have to be clear ahead, or give way to the inside boat. Isn�t that going to be rather hazardous? EB: It could be very hazardous and that�s, certainly, one of the areas of the race that we are trying to understand, without ever having experienced it, so we�re trying to pontificate on what that might be, but it�s not something that we�re sure about at this point. Have you been developing rules? EB: We�ve talked about it a bit and we do have to get more serious about that, but our focus has been on trying to catch up on the building process and, of course, trying to learn about how to sail the boats. Now that we�re sailing multihulls, I�m beginning to see that there are some areas that the standard match race rules may struggle to deal with and these need some discussion. The multihull fraternity, which we�re sailing with at the moment, generally, has a much more casual attitude about the rules. They let each other take liberties, here and there, because it�s the nature of the boat. It�s not that they don�t know the rules, or don�t want to apply them, but they realise that if you are in a tough spot today, tomorrow the other guy that�s next to you might be. It�s a safety game too, so everybody gives a little more than you might think and certainly compared to a college regatta, in the States, or a Farr 40 event. There are a lot of situations, with various multihulls, where you can�t just strictly apply the racing rules of sailing, because the boats are going so fast and what�s happened, over the years, in my experience is that the group, as a whole, has developed a bit of a more casual approach. They are more tolerant with each other and not so absolute about the rules and that�s how it�s come together. In the America�s Cup, with just two competitors, you can�t say it�s going to be the same way. That�s one of the things we have to sort out. Over lunch with some of the Extreme 40 skippers, there was a view that BMW Oracle is building two boats; one in case you pick a light wind venue and another for stronger winds. Do you think that�s right? EB: We have no idea; we know what the press knows. We�re starved for information on what BMWO are doing; they�ve done a nice job of keeping things quiet. I think in a few weeks we�ll get an idea of what they�ve been doing, in terms of a boat, but as to whether they are building two boats ��. no idea. What about the safety angle; how are you going to handle that? 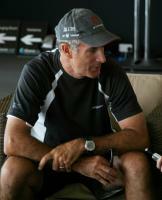 EB: The safety angle is something that all of the team are concerned with and are giving input into what we should do. Where it comes to sailing these boats, we�re going to have to quickly learn where the danger areas are and, very conservatively, add power and add difficulty to the manoeuvres. Again, I think James said this as well, a catastrophe in a boat this size can be campaign ending, so you can�t get into a situation like that. It�s one thing to have a sail break, or a boom break, or a mast break; rudders break, other things break, this sort of thing happens on all sorts of boats and you can still be safe. The fact is that, unlike the 40s and even the 60s, where most people who have raced the boats in any serious manner, have experienced a capsize, this is going to be a lot more like racing the cats and tris around the world, where you just have to know when to power down; you can�t afford to learn it the hard way. It sounds as though it is possible that neither boat makes the line, because they are so unknown they could get wrecked in practice. EB: Well there�s always a chance of that and, if you look back to the early days of the IACC rule, there were a lot of races in the Louis Vuitton Cups, in San Diego and in New Zealand, where boats didn�t show up for the start, let alone start racing and have a break down. In those days, teams just didn�t make it out because the engineering was a bit unknown, the structures and all the things that were being experimented with were new, nobody had dealt with it. Depending on how each team approaches what they do with these boats, it could certainly happen. We hope that both teams have enough time on the water to sort these things out, because it�s a much better event when all the sailors have had their equipment long enough to know how it functions and understand it well. Will it be like a normal America�s Cup, where the start is crucial, or will they be so fast that it won�t matter too much? EB: The start is always helpful, if you can be ahead, but I imagine there is going to be a fundamental difference in the two boats and one of them is going to be faster, which will be a great advantage when you have a course that�s so long. One of the reasons that, as a group, in the 32nd Cup, we tried to make the racing more condensed, with a limited time period was that you almost always had close pairs at the weather mark, unless it was very light. Again, if you remember back to �92 and �95 and 2000, there were huge separations; we, regularly, had 3 & 4 minute deltas at the finish line, whereas, in the last Cup, an awful lot of races were inside 30, or 40 seconds, which is nice and close. That was a function, not only of the class, which a lot of people say was the big reason. Certainly, the class matured and it got closer, but it also had a lot to do with the wind speed we raced in, which was mostly in that 8 to 14 knot range, and the length of the course; not making it too long. When you get 20 mile legs, suddenly the start becomes a minor part of the whole. Francis thought that a boat that wasn�t the maximum size might be faster. Are you going to give anything away? EB: Again, that�s one of the arguments �. what do you make? We know a little bit about what we are guessing we�re going to face, so you take a stab at guessing what that�s capable of and go from there. 90 by 90 seems to be somewhat unusual, especially for a racing boat. EB: Yeah (laughs), I agree. So, are you expecting BMWO�s boat to be a sort of large version of Groupama 2? EB: We know so little; you can guess all day, but guessing is a great way to get it wrong. When do you expect to launch your boat? EB: I don�t know. The guys in Switzerland are building it and they�ll tell us when it is time to go sailing. I mentioned to Jimmy Spithill that most, if not all, G-class multis have broken something and had to go back to the yard for modifications. What are the chances that this won�t happen to your boat? EB: Yes, we�re going places people haven�t gone before and, whenever you do that, there�s a great risk. Both teams have great designers and builders who will do their very best job, but we are going into an area of boating that�s never been explored before. OK, the big cats and tris that have gone round the world are this size, but they are made for reaching and running and now we are looking at boats that are trying to be efficient upwind and we are also looking at boats that don�t have to make it round the world. Are you personally excited about this? EB: I�m very excited about seeing what it is going to be and I think it is going to be very historic, because these boats will be something that no-one has gotten a hold of before. That is very exciting, but I�m also apprehensive about what it�s going to take to get it right. We all want to do the smart thing and win. 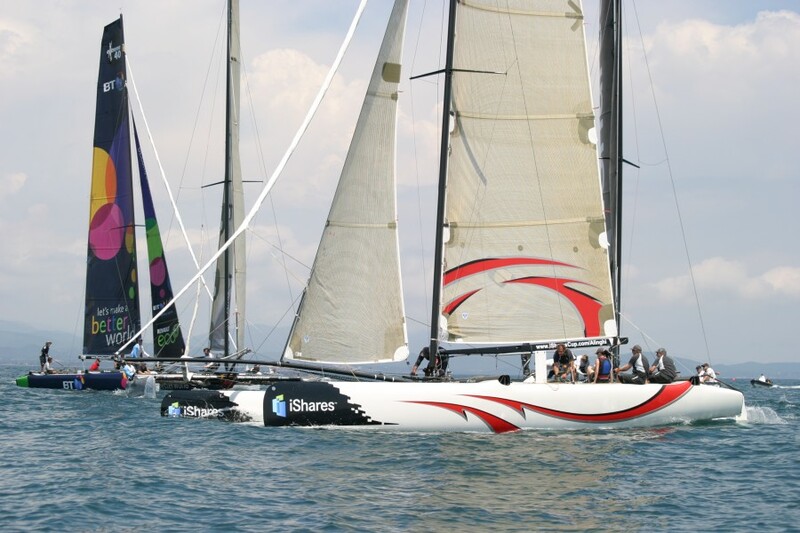 How much multihull racing had you done before this? EB: I did a little bit in the early �90s, I think it was, we had a pro circuit, in the United States, and I sailed Hobie 21s. It�s a pretty basic production boat, set up the same way these 40s are, with a gennaker and a jib, but nowhere near as powerful and exciting. We�d do about 8, or 9 events and it was great fun; not so different from what iShares is doing now, except that it was mostly run off a beach. The people stood on the beach and watched and, at the end of the day, you sailed your boat up the beach and pulled it out of the water. That�s about the total of my experience until now. Obviously, Alinghi would like to be holding a conventional AC33 right now, but - as a sailor � what are you finding most enjoyable, what you�re doing now, or what you would have been doing if things had gone as planned? EB: I really enjoyed the process of the last America�s Cup; the development, learning how to race the boat just that little bit better than yesterday and I�ve always enjoyed the steps you go through to get there. At this point, we are doing the same thing in multihulls, but we�re taking bigger jumps each time we sail, because we have a lot more to learn. I don�t know that I would have chosen to go though that process and race in the iShares Cup, if we hadn�t got into this situation with BMW, but in the end it�s the same process with different equipment. It�s a bit like changing the sort of automobile racing you do; great drivers can move around and do a pretty good job, but it can take a while to reach the peak. We just have to cut that corner in as short a period as we can. One last question about AC32; SUI100 seemed to be able to hang on to ETNZ, in adverse circumstances, for a lot longer than any other boat could have. Are you able to explain the secret, now the V5 class is over? EB: I think the answer has several parts to it. The designers and builders did a great job and it was a great boat and the guys who sailed it did a great job; the equipment functioned exactly as it should; the sails were fantastic; right down the line, everyone who was on that team put that bit extra into whatever their job was and we ended up being able to hang on, when it was hard, and extend a bit when there was an opportunity. So there was no single big secret? EB: Oh no, no, nothing like that. What you saw in the last Cup was that, in general, the teams were all better at sailing their boats than they ever had been. A lot of people have misinterpreted AC32 and they think what made all the boats go at around the same speed was because the class was mature. There is, certainly, a bit of that and the modification from Version 4 to Version 5 helped, but the biggest reason the boats were so close at the end was making the teams take part in the ACTs. Going to all those ACTs forced teams, which would have been last minute and weaker teams, to come sailing and learn about their equipment and you saw the result of that in closer and closer matches all through the America�s Cup cycle. The result was that, though albeit forced upon everybody, it was the best job a group of America�s Cup teams had ever done in preparing for the event. Never before had teams had so much time on the water and so many race practices, leading up to the real racing, so you didn�t see those silly mistakes on the starting line, the breakdowns, the equipment failures, the errors of judgement that you saw in previous Cup cycles. What you saw in the end was the two teams at the top of that heap, who did all the little things that little bit better and it was very exciting to be part of that. Thanks for talking to us, Ed.